the road and down on the bank. so come look and see them this year again. 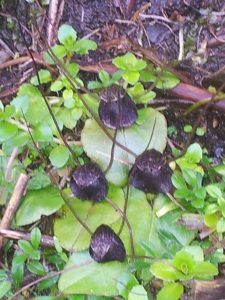 Yes, the corybas season is upon us, so many sizes. The one I found must be call macracyrabas I think, a spider looking plant that was very obvious to the eye, not like some that have small flowers as we saw on the track last year. Well, the winter is near over so come walk on the tracks again. One man called today and asked if he could come so I gave him the ok and off he went, just wanted to get out of the city for the day and it seems that the Fenceline track is closed so ours a good options. He said it doesn’t look like many visit it, did I know about the great walks app ( that’s something to consider and get help on for sure). The plant labels from ceramic tiles just need a bit of an effort to get in place. The idea of a walk of remembrance as an option has been making headway with thoughts of questions and making some artistic designs with sharpies and pen, then sprayed with varnish. How to make it more of a treasure hut rather than a blaring thing it what I need to think about, with positions of questions being less obvious than plant signs.